Join the Oregon Department of Human Services on Monday October 15th from 1:30pm – 3:00pm either online or in person! DHS Director Fariborz Pakseresht and the DHS Executive Team will present brief program and legislative updates followed by a question-and-answer period. Join in person, by phone, through live streaming or follow along on Facebook or Twitter. When: Monday, October 15, 2018, 1:30 – 3:00 p.m. Questions or accommodation requests related to a disability, please contact Communications.DHS@state.or.us. A good faith effort will be made to fulfill requests. Please forward this message to interested stakeholders and partners. Note: Deadline for in-person RSVP is Thursday, October 11th. High school students with intellectual disability typically attend public school with their same age peers. But what happens at graduation? Historically, those peers go on to college or vocational training or work but the student with ID may go home with few options to continue their growth toward the adult life they want. Until recently, individuals with ID were excluded from attending college and sometimes from work in gainful integrated employment. Recent national and Oregon legislation has removed barriers and established funding to develop inclusive college and employment experiences for students with ID. The U.S. Department of Education awarded funds to 44 universities nationwide, including Portland State University to lead the way in the creation of inclusive college and career experiences for students with ID. Research indicates that graduates of these inclusive college/employment certificate programs are achieving gainful integrated employment and higher wages (www.thinkcollege.net). CCS students establish their career goals through a person centered planning process and then work in competitive wage integrated employment on or off campus. Advisors help student find college courses that add to their preparation for their career area. In years 3 and 4 students move into off campus employment that aligns with their career interests. Students attend college classes on their own. They receive academic support through an Individualized Learning Plan and academic coaching frorn other PSU students. They explore and engage in campus life with a peer navigator if they wish. A goal of PSU is for all graduates to become engaged citizens in the community and this goal is enacted through community based learning in courses and through 150+ student – run organizations. PSU students in CCS are thriving and PSU staff, faculty, students and employers on and off campus are committed partners in this exciting endeavor. The purpose of this Advisor/Counselor position is to support the inclusion of college students with intellectual disabilities in employment experiences and campus involvement throughout their 4-year Career and Community Studies Certificate (CCS) experience at Portland State University. This position will focus on developing integrated, paid employment for all students starting in year one within typical jobs opportunities on campus and in the community. CCS students will need to transition to career-focused off-campus jobs prior to completing their 4th year of college. Specific job responsibilities will include providing individualized supports with CCS students (e.g., weekly advising, job development, providing job supports, implementing person-centered planning processes with students and their teams, planning and supporting the transition to campus housing), coordinating supports for employment and campus inclusion (e.g., support campus employers, coordinate job coaching supports, facilitate inclusion into campus housing), maintaining internal and external partnerships (e.g., facilitating the monthly CCS Employment team meetings with employment partners, collaborate with campus partners), and supporting the CCS team to implement the program (e.g., program admissions, on-boarding new students, assisting with planned events with students and families, program evaluation tasks). This position is currently grant funded through 2020. We are optimistic that there will be continued funding for this position after the grant ends. Other colleges in Oregon are also moving toward creating more inclusive college and employment programs across the state. For the right individual, this is a unique opportunity to be a part of ground breaking work. After reading the position announcement, contact Susan Bert, Co-Director of Career & Community if you have with questions about the position berts@pdx.edu. Community Vision was founded to provide Supported Living services to individuals who wanted to live in their own home with one-on-one support. While this service remains a core mission, CV also provides in home supports, employment supports and anything that fits their customers’ unique needs, goals, and dreams. This helps the person live, work and thrive in the communities of their choice. INW is proud to be part of the Oregon Developmental Disabilities Coalition advocacy efforts with legislators in Salem. There are two more DD Advocacy Days left during the 2018 short session: Tuesday February 27th and Tuesday March 6th, 2018. Follow this link to learn more about how you can make your voice heard by connecting with Oregon lawmakers on issues related to eligibility changes and ongoing funding for home and community based services for Oregonians with I/DD. 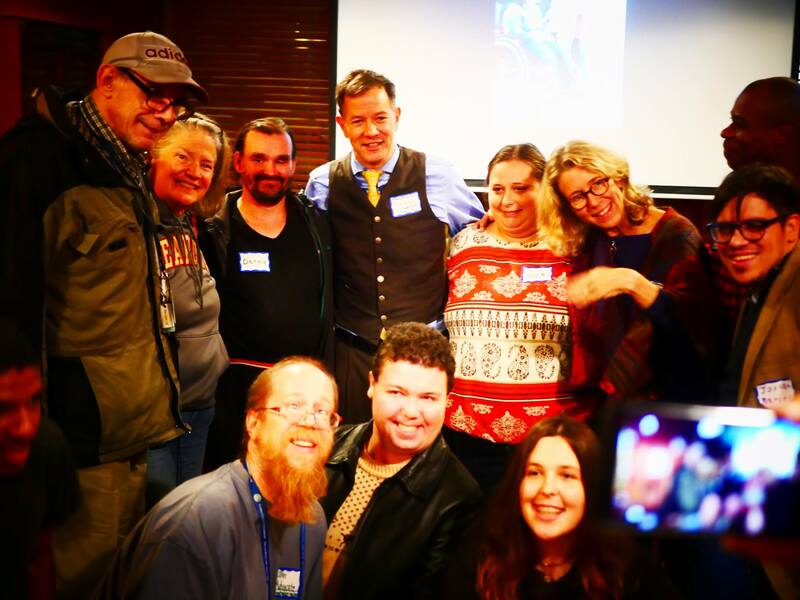 Independence Northwest is proud to have been a sponsor of last night’s hugely successful disability advocacy event Advocates Unite at Lucky Lab in Portland. Huge thanks to our friends at Urban Advocacy and fellow sponsors Community Pathways Inc., Community Vision, Inclusion Inc., MENTOR Oregon, Oregon Self Advocacy Coalition, and Self-Determination Resources Inc.
Special thanks to legislators Representative Alissa Keny-Guyer, Representative Rob Nosse, and Representative Carla Piluso for coming out in support of our community! You can learn all about the proposed budget cuts and adjustments in this great article by brokerage association director Katie Rose. Remember, these are cuts mentioned only in the Governor’s budget – legislators may be looking at other ways to adjust funding to balance the budget. This Saturday, attend the Town Hall at PCC Sylvania in Portland! The Joint Committee on Ways and Means has scheduled a series of Town Hall meetings across the state. Having advocates from the I/DD community show up and give testimony at these public budget hearings is very important. This is a unique opportunity to tell legislators what your services mean to you and why keeping service networks strong is important for you and your family. We have heard that legislators aren’t getting a lot of feedback from the community on services – please take this chance to make your voice heard. What to expect if you go? Be prepared for large crowds, and plan to arrive early, especially if you want to sign up to give testimony (at least 1 to 1 ½ hours early). The sign-up sheet for testimony fills up quickly. Even if you don’t plan to give testimony, your presence at these events, wearing or waving something yellow in support of the DD Community, will send the message to legislators that the DD Community is unified in its support of DD programs and services. RSVP and connect on the event Facebook page here. To support your participation in these statewide budget town halls, the I/DD Coalition will ensure a host will be on site at the event to provide you with fact sheets, advocacy stickers and more. Please register for this event via Facebook to stay informed and receive the latest information. Thanks to our friends at the I/DD Coalition and GO! Project for their great work organizing the community and providing the content for this post. In the last few weeks, Personal Support Workers and brokerage customers should have received information directly from the State of Oregon and/or SEIU regarding an important change just around the corner. For a good many years, TNT Fiscal Intermediary Services has issued paychecks for PSWs serving our customers. TNT’s contract with the state ends at the end of 2016 and a new agency, PCG Public Partnerships LLC (known as PPL) will be taking over this responsibility. So in the very near future, Personal Support Workers will stop getting payment from TNT and start getting payment from PPL. What does this mean to Personal Support Workers and Customer-Employers? Customer-Employers and Personal Support Workers can return their packets in a variety of ways: by mail, fax, or secure email. If you’d like some hands-on help, consider attending one of the optional Enrollment Information and Help Sessions for Employers and PSWs. Multiple sessions will be held here at Independence Northwest and there are sessions in all three metro area counties. RSVP for a session by clicking here. If you have received your packet, you can bring it to the session in your area to receive hands-on help. If you haven’t received it by the time the session you want to attend happens, they’ll print a packet for you there and assist you in person. You can also call PPL Customer Services for help. Their number is listed on this flyer or you can visit this website.The state’s eXPRS Facebook page has a ton of resources related to the change as well. Transition time is very tight on this, so be sure you’re responsive and get the help you need! If packets are not completed and processed by the end of the year, payment for services may be affected. If you have questions, don’t hesitate to reach out to PPL for help. I’m writing you to ask for your help. On Monday, Legislators meet to make final budget decisions and Brokerages statewide may receive cuts to our administrative and case management funding. Your support can make all the difference in making sure that doesn’t happen. I have come to know many of you over the past couple of years as INW has done outreach to the community, educating hundreds and hundreds of community members on the systemic changes, specifically the K Plan (Community First Choice Option). While the K Plan has brought a lot of funding into the system to pay for direct services, it has not added a penny to our administrative budgets. Personal Agents who were supporting 45 people historically managed about a half million dollars in Medicaid funds on behalf of customers and providers. Today, many manage double, triple, and quadruple that. Think about the way you’ve seen your plan or the plans of others change over the past two years and multiply that by 7,800, the number of people brokerages serve statewide. The change has been huge. Add to that the Adult Needs Assessment requirement, the unfunded burden of the eXPRS payment system implementation, our Personal Agents now entering timesheets on behalf of many providers, the state’s change to a much longer and more complicated ISP, and enormous systemic shifts, and we are in no place to take a statewide reduction in funding. I believe that some lawmakers may be confusing the K increase with an overall funding increase and it’s just not the case. I have included a couple of example letters you might use as a template for your email or as a script for your phone call. If you could contact the legislators listed below (whether you live in their district or not) it would be great! If you’re interested in additional details about the Workload Model issue, check out this in-depth explanation: Brokerage Reductions at 90%. The importance of your support is immeasurable to us right now. I wouldn’t ask for last-minute action if I didn’t believe it could change the future. Your voice will make all the difference between a continued move toward better and more person-centered services versus a world where we may be looking at increased caseloads and a reduction in overall quality for a system known for its innovation, responsiveness, and vision. Our system has taken enough hits this past biennium. Best to you and yours and thank you again for your support and the opportunity to serve this community. I am a customer of OR a family member of a person who receives brokerage services for people with IDD (intellectual and developmental disabilities) here in Oregon. I understand that you are making budgetary decisions next week regarding funding for case management. PLEASE FUND BROKERAGES AT THE 95% WORKLOAD MODEL LEVEL – AND NO LESS. While the Community First Choice Option (K Plan) brought more services to me/my family, it did not add any additional funding for brokerages to administer double and triple the services they have administered historically. We need to know that our brokerage Personal Agent will be responsive when we need him/her. If you reduce funding, we know that increased caseloads are likely. That means we won’t have access to the services we need as quickly. Some of the services I receive right now are: __________________________________. The time I need my brokerage support the most is to help me ______________________________. Statewide, brokerages have experienced huge increases in workload related to the K Plan, the state’s much more complicated ISP, the eXPRS payment system, and all the paperwork changes. I rely on these services to live an independent life in the community. Please fund brokerages fairly in the next biennium – 95% and no less. Thank you for your consideration and your service. I am a Personal Support Worker/Employee/Provider of services for a person who receives brokerage services for adults with IDD (intellectual and developmental disabilities) here in Oregon. I understand that you are making budgetary decisions next week regarding funding for IDD case management. PLEASE FUND BROKERAGES AT THE 95% WORKLOAD MODEL LEVEL – AND NO LESS. While the Community First Choice Option (K Plan) brought more services to the people I serve, it did not add any additional funding for brokerages to administer double and triple the services they have administered historically. We need to know that the brokerage Personal Agents we work with will be responsive when customer needs arise – including processing payment to providers like me. If you reduce funding, we know that increased caseloads are likely, meaning slower response time for getting essential needs met. As a provider, I rely on the brokerage for ___________________________________________. Statewide, brokerages have experienced huge increasing in workload related to the K Plan, the state’s much more complicated ISP, the eXPRS payment system, and all the paperwork changes. The people I support rely on these services to live an independent life in the community and my livelihood is reliant on this program. Please fund brokerages fairly in the next biennium – 95% and no less. Thank you for your consideration and your services. Oregon is well on its way to crafting a final budget for the next two years. Right now, the word is that there will be cuts to programs for people with Intellectual and Developmental Disabilities (I/DD). As part of the process of gathering public input, the Ways and Means committee is traveling around Oregon in a roadshow, holding public hearings and inviting people to come speak to their priorities for state funding. The Ways and Means committee needs to see the I/DD community, they need to hear the I/DD community, and they need to walk away from that roadshow knowing that people all over Oregon value services to people with I/DD! We encourage anyone who is concerned about the future of supports and services for individuals with developmental disabilities to make attendance at these events a high priority! We hope to see you there! Your voice matters! Potential Budget Cuts to Brokerage Funding – Your Help is Needed! Distressing news out of the capitol: lawmakers may be looking to cut $140 million from human services in order to fund a budget “hole.” The question is, what does a $140 million cut to human services look like? Though plan hours are not likely to be cut, vulnerable areas include provider pay rates and Brokerage funding for Personal Agents. Brokerage Personal Agents and direct support providers have worked to implement dozens of system changes over the past two years. With these changes has come a lot of additional workload and responsibilities, which is already cutting into the bottom line: time spent with Brokerage customers. Any reduction in funding is going to cut further into that time. Now is the perfect time to flex your advocacy muscles. Advocacy is defined as “the act of pleading or arguing in favor of something, such as a cause, idea, or policy,” and if you’re a human, chances are you’ve been engaging in advocacy your entire life. Some people are certainly more comfortable speaking their minds than others. The trick to being a good advocate isn’t about becoming a perfect speaker, it’s about finding the right message for you. When you find a cause or idea that is true to your heart and soul, you will find that the words flow much more easily. How have your Brokerage services helped you to live the life that you choose? Please call, email, or visit your state representatives and senators, and let them know how important your Brokerage services are to you! For more information, check out the Oregon I/DD Coalition’s special bulletin on the current need for advocacy. You can find your legislators, and see the list of legislators on the Ways and Means Subcommittee on Human Services, the joint committee in charge of making legislative budget recommendations. You can also get talking points and more information about each of the Coalition’s four priorities: Employment, restoring the Fairview Housing Trust, raising DSP wages, and funding Brokerage and county case management at 95%. Each of the four priorities were selected because they fund the cornerstones of a full and meaningful life in Oregon’s communities. Even small cuts to the 95% Case Management funding mean losses for Brokerages from last biennium, at a time when workload has greatly increased. Let your legislators know that overworked/underfunded PAs mean that you can’t get the services you want, when you want them. Urge them to fund the Workload Model for Brokerages and counties at 95%! On Thursday, February 19th, 2015, brokerage representatives once again went before a legislative committee to advocate for our services. This go round, advocates provided input to the Joint Ways and Means Committee. Independence Northwest customer Ruth Geislinger provided moving testimony about how important her services are to helping her live a full, independent life in the community. And brokerage association Executive Director Katie Rose educated lawmakers on the need for appropriate funding to maintain quality services as expectations and regulations increase workloads across the state. 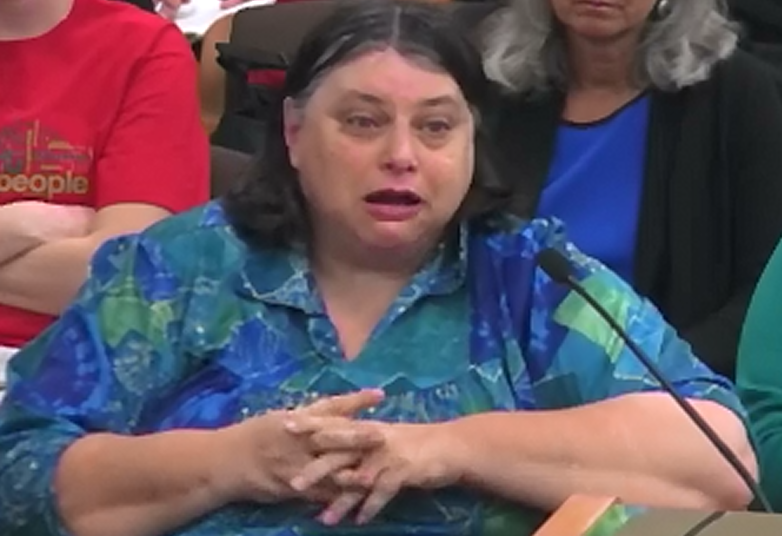 Additionally, Leslie Sutton, of the Oregon Council on Developmental Disabilities provided testimony on the Fairview Housing Trust Fund being removed from the Governor’s proposed budget; those funds had been earmarked long ago to provide housing opportunities for people with disabilities. Other testimony on the video include our friends at the Oregon Rehabilitation Association, Edwards Center, FACT, the Oregon Council on Developmental Disabilities, county partners, and several other provider organizations, self-advocates, and family members. Check out the full video here. Testimony from Leslie, Katie, and Ruth begin at 50 minutes. 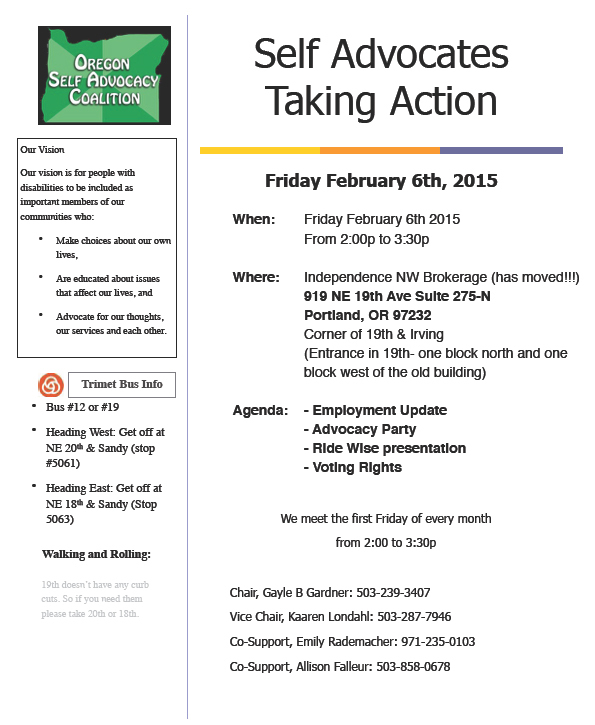 Self Advocates Taking Action is a self-advocate group for people with intellectual and developmental disabilities. The group meets at Independence Northwest on the first Friday of each month from 2PM – 3:30PM. The next meeting is Friday, February 6th. This month’s agenda includes Employment First updates, Advocacy Party, a presentation by RideWise and information on Voting Rights. Questions? Contact Gayle Gardner at 503.239.3407 or Kaaren Londahl at 503.287.7946. See you there! In the spirit of the new year, the Oregon Support Services Association announces two changes in leadership. Larry Deal, Executive Director of Independence Northwest brokerage, has assumed the role of OSSA President. He follows in the footsteps of Margaret Theisen, whose tenure spanned the birth of the brokerage association and four incredible years of unprecedented growth and change. We are deeply indebted and grateful to Margaret for her influential and principled leadership. Margaret passed the torch to Larry after the association’s Board of Directors meeting in December. Larry brings with him 13 years experience in Oregon’s Support Services system, and a deep talent for innovation, communication, and partnership. Dan Peccia of Self Determination Resources Inc. and Bill Uhlman of Eastern Oregon Support Services Brokerage will continue in their roles as Vice President and Secretary/Treasurer respectively. Additionally, the association will begin a transition from its first Executive Director. For the past year, OSSA has been led by the incomparable Kathryn Weit. Her advocacy, passion, and leadership has greatly furthered the mission of OSSA by promoting, assuring, and protecting the integrity of Support Services for adults with intellectual and developmental disabilities statewide. We’re excited to announce that beginning in February 2015, Katie Rose will assume the Executive Director role full-time. Katie will be leaving her position of six years as the Director for the Mentor Oregon Brokerage presently serving individuals in the greater Portland area. As OSSA Executive Director, she will report to the OSSA Board of Directors, which consists of the 13 directors of the Oregon Support Services Brokerages. Katie can be reached at katierose@oregonsupportservices.org beginning February 1, 2015. Stay tuned for additional contact details. If you’d like to learn more about the association, please visit www.oregonsupportservices.org. Over the past year and a half, so much time has been spent deconstructing and reconstructing Oregon’s Intellectual and Developmental Disabilities system, there’s been little opportunity to sit back and celebrate some of the successes. Here are five things that are currently working well – and that deserve their moment in the sun. Providers are beginning to expand capacity. This one’s a slower burner, but it’s beginning. Customers, families, and professionals have all been highly concerned about the increase in funding since it came without an ounce of provider capacity expansion planning or incentives. Oregon put the funding before the resources. In recent weeks and months, many agencies have begun reaching out to brokerages and are expanding their services to our community in everything from in-home to employment supports; in 2015, I believe we will see a tangible increase in options for our customer base. There’s a recent willingness for course correction when things aren’t working. If you haven’t heard of DSA (Day Support Activities,) consider yourself lucky. In short, DSA was an exercise in rushed change implementation. Ultimately, it changed rates, it changed processes, and it changed the definition of certain services. The process upended Brokerage, CDDP (Community Developmental Disabilities Program) and provider organization operations and damaged the integrity of reporting systems statewide. However, collaborative efforts (led by ODDS) amongst brokerages, CDDPs (counties), providers, and state has made a real difference. Recent changes in leadership have assured a common sense, customer-first approach to problem solving. In other words, there’s strong collaboration happening again in Oregon. This is a very good thing – let’s do more of it. We’re sticking with our current needs assessment tool. One of the major concerns brokerages have been facing while implementing the still-new functional needs assessment has been knowing full well we’d have to change assessments again at the beginning of 2015. Recent actions from the state suggest that we will be working to make the current brokerage tool (the Adult Needs Assessment) work well into the future. For brokerage customers, this is promising. We need consistency, stability, and some time to do some in-depth analysis on the efficacy of the current tool first. This decision deserves kudos. Perhaps most significantly, Oregon is focusing on individual goals – again. If you have been working in the system or receiving services for the last year and a half, you’ve no doubt noted the troubling focus on deficits-based language and approach. I remember being in a meeting very, very early on in the K Plan implementation when it was announced by someone with significant influence that “this is no longer about goals, it’s about needs.” Soon, that refrain began to echo. Fortunately, that interpretation is no longer alive and well. What some people didn’t understand early on in the transition process was this: Brokerages have always addressed disability-related support needs. And we have done so while helping people reach their goals. You don’t provide publicly-funded services without making sure needs are documented and necessary. A sophisticated, supportive, holistic system addresses health and safety while placing a premium on the wants, needs, and goals of the individual. We know it can work because we’ve been doing it for thirteen years. I can’t say enough how pleasing it is to hear high-ranking leaders in our state stating that goals matter. There are many issues we must continue wrestling with: the eXPRS payment system and pending Personal Support Worker entry, the monthly versus annual services issue, the ongoing review of Behavioral Supports, changes to supported employment, and many more. But as we inch ever closer to the new year, it’s safe to say that we all hope for continued positive developments in the Oregon I/DD service delivery system. We’re a resilient, engaged, and growing community. Fingers crossed we can focus the coming year’s efforts on enhancing, expanding, and enriching the lives and experiences of the individuals, families, and communities we support. Oregon was once at the forefront of community-based services in our country; with continued focus, effort, and partnership there’s no reason that can’t be a reality again. 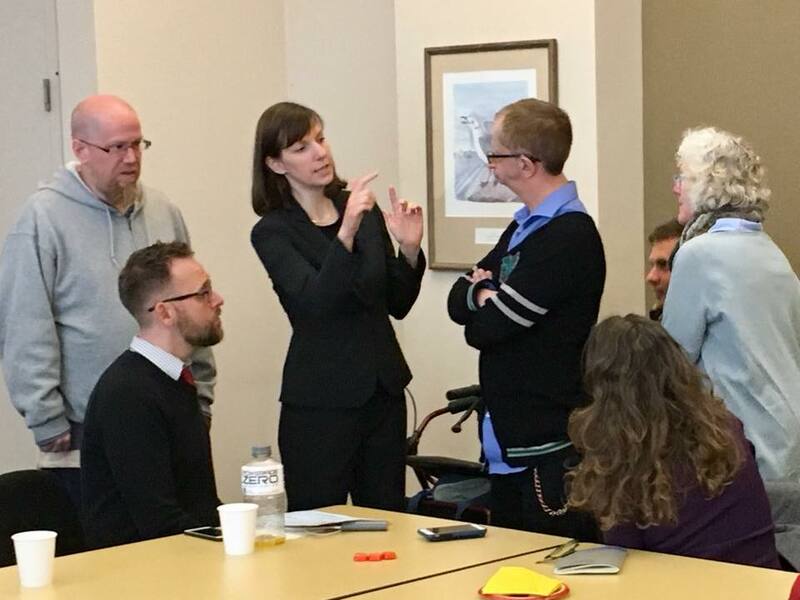 On Monday, November 10, 2014, Kathryn Weit, OSSA Executive Director and I participated in a vision and values discussion organized by the Office of Developmental Disabilities Services and the Oregon Council on Developmental Disabilities. Later in the day I stopped on the way home for groceries and when asked how my day was by the clerk, I said my day was excellent. I can’t recall the last time I said that about work! I surprised myself with that comment. We spent an entire day discussing and refining the language for the values and vision statements that will be used to guide the system that provides services to people with Intellectual / Developmental Disabilities. The people attending the meeting represented all parts of the DD system, including State staff, and all were highly engaged, respectful and positive. It was the first meeting with a constituent group in my recent memory that was not dominated by complaints, whining, and finger pointing. We don’t have final outcomes on vision or values statements, but within a week we will have the vision statement and we will have values work after that. I feel very inspired by the day, and I am eager to see the final vision product by the work group. When that is done later this week, final definition of the values statements we worked on will go forward. I am on that work group with 6 people including Lilia Teninty, the State DD Director. Finalized, these statements will be shared widely and used to guide future decision making. Next steps include scheduled discussions on Medicaid and the K Plan with Robin Cooper, an expert on these issues from The National Association of State Directors of Developmental Disabilities Services in Washington DC. Once we increase our knowledge base with, and understanding of Medicaid and K, Lilia plans to pull together groups to address specific topical areas beginning with case management. I think Lilia is very much on track and as always, Bill Lynch’s facilitation was important and focused. While our work didn’t address many of the day-to-day issues we are struggling with, I feel more confidence in our direction than I have in over two years! I think Monday was a great start to a different/better future! 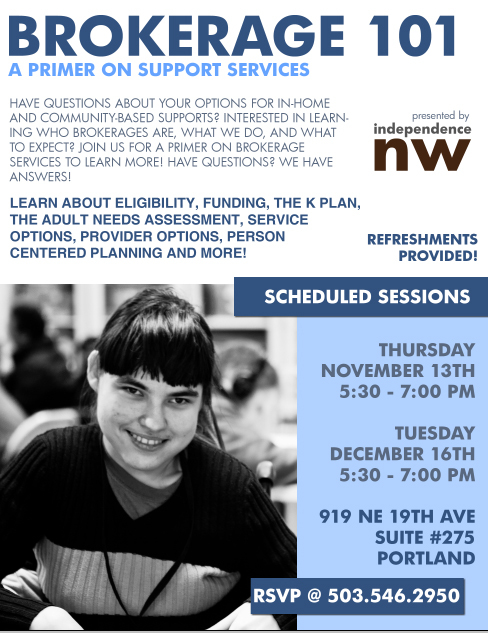 In November and December 2014, Independence Northwest will be offering a series of forums: Brokerage 101: A Primer on Support Services. The forums are designed for people new to brokerage services – whether just recently referred (in the last year) or considering their options for in-home and community-based supports. You’ll learn where brokerages come from, what we do, and what to expect from our services. These presentations are perfect for students in transition and their families! Topics include: eligibility, funding, the K Plan, the Adult Needs Assessment, case management services, support service options, provider options, person-centered planning, supported employment, and more! Join us to have your questions answered! Friend and advocate of brokerages and the brokerage community Molly Mayo, founder of On-the-Move Community Integration, recently spoke with folks at KBOO about the state’s planned changes to provider organization services. Follow the link below (start at 18 mins or so) to hear Molly explain the community’s serious concerns about changes to service descriptions and provider rates. We share her concerns and applaud her public advocacy efforts and outreach. We, the six metro-area support services brokerages, wanted to send out a quick note regarding the current status of transitioning service codes, amending plans, and adjusting rates given the potential September 1st changes. Our hope is to work with the State on a reasonable timeline for implementation this fall or winter in a thoughtful process that includes a stakeholder work group charged with leading and influencing the transition. As always, we appreciate your patience and partnership as we manage such significant systemic change. Your recent and ongoing advocacy is very much appreciated. Surely, we all agree that a thoughtful, proactive approach to transition is key to serving our customers and community in the most respectful and productive way possible. We know there are scores of unanswered questions out there and we are preparing to gain the understanding necessary to respond to them given our limited resources during this transition. Without clarification and without the full participation of our customers, we are not able as of now to amend goals, plans, or service agreements. Please stay tuned – more details shortly. “As you are aware we have many priorities that we are focusing on, all with a July 1 implementation date. We have heard from many of you that these converging priorities are causing angst, stress and strain on you, and on the system. We, as well, are discovering the complexities of handling so many moving parts all at once. As such, based upon feedback from many of you and weighing our internal priorities and commitments with SEIU, CMS and others, we have come up with the following strategy to delay portions of the work and to stage implementation in a more manageable way. Additional information will be coming out over the coming weeks about the details behind these strategies so please pay close attention to emails and other communications over the coming days. First, July 1 is a milestone for new employment services to be offered. These services are included in the Medicaid waivers that will be submitted for approval with a July 1 effective date. These new services will still be offered as of July 1. July 1 was also a targeted date for implementation of a new rate structure for employment services for both the comprehensive and support service system. The new rate structure will be finalized next week, however, at the request of multiple providers, we will hold off on implementation of those rates, with the exception of the rates for the new services, until September 1, 2014. The new services, which include Discovery and Job Development will be paid at the new outcome based rates. All other services will continue to be paid at the current, daily rate. This additional time will allow providers of employment services an opportunity to analyze how the new rates will apply to their service arrays. Additional information about the rate transition schedule, and expectations for tracking, billing and reporting of services provided during July and August will be coming shortly. Additionally, we have been challenged to provide training to the large number of personal support workers, CDDP and Brokerage staff, and other providers on the new plan entry and claims process within the eXPRS system. In order to allow more time for training and other associated activities, we are delaying the implementation of Plan of Care functionality to September 1, 2014 as well. We will be working with partners, including SEIU and providers, to develop an implementation plan from September 1 forward, beginning with employment services. The delayed schedule and restaging of activities is important to assure successful implementation, but it does not deter or alter the strategic or programmatic outcomes the changes are designed to achieve. There’s a lot happening. We understand that change can be confusing, frustrating and overwhelming. Sometimes all three. So here’s a cheat sheet for what you need to tend to in the next forty days. Be sure to respond to your Personal Agent’s (or a state worker’s) call to complete the new Functional Needs Assessment. It’s essential these are completed for everyone by June 30th. This allows the state to draw down increased federal funding via the new K Plan. Additionally, be ready to revise your plan to make some language changes. Your PA will help you with that. One great way to better understand the changes is to attend one of INW’s community forums. We have two scheduled in May. Make sure the customers you serve have scheduled a Functional Needs Assessment with their PA (or a state worker.) If they need some support during the assessment and would like you to assist, offer your help. If you have not already, you must apply for and receive a Medicaid provider number. Sign up by filling out the Provider Enrollment Agreement form as soon as possible. If we’ve contacted you about updating your Criminal History Check, be sure you respond quickly. All PSWs must have a CHC completed every two years. You cannot be paid without a current check on file. Attend one of the upcoming Personal Support Worker webinars. There are currently three scheduled. The webinars will give you basic details on the state’s payment system (eXPRS) and how the way you’ll be paid is changing. Click here to learn more. Attend one of INW’s community forums. If there are changes to the deadlines or expectations (and there may be), we’ll keep you updated via additional mailing. In the meantime, keep an eye on the INW blog or our Facebook page for the latest. As always, thank you for the opportunity to serve you, your family, and this community. Our May 2014 Big Changes in Brokerage Services Community Forum dates are set! Join us on Thursday May 22nd at 6pm or Friday May 23rd at 10am. Learn more about the K Plan, the upcoming needs assessment requirement, new options for case management, plans for a new universal ISP, changes to provider payment and rates, and much more. We’ve got lots of details to share. Join us! 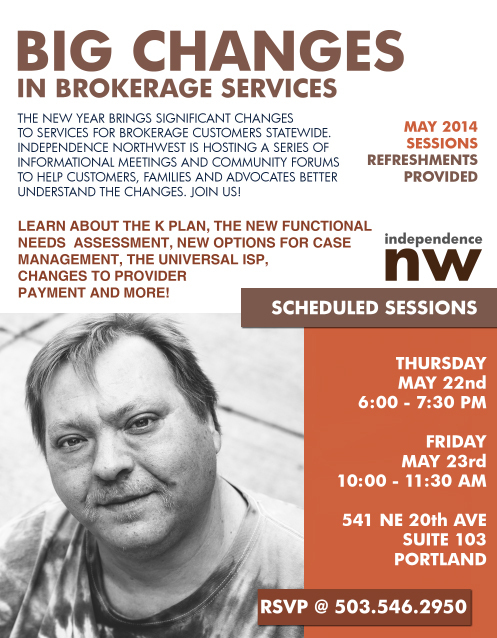 RSVP to Rachel at 503.546.2950 or by emailing rkroll@independencenw.org. Our April 2014 Big Changes in Brokerage Services Community Forum dates are set! Join us on Wednesday April 2nd from 10AM – 11:30AM or Wednesday April 23rd from 6PM – 7:30PM. Learn more about the K Plan, the upcoming needs assessment requirement, new options for case management, plans for a new universal ISP, changes to provider payment and rates, and much more. We’ve got lots of details to share. Join us! 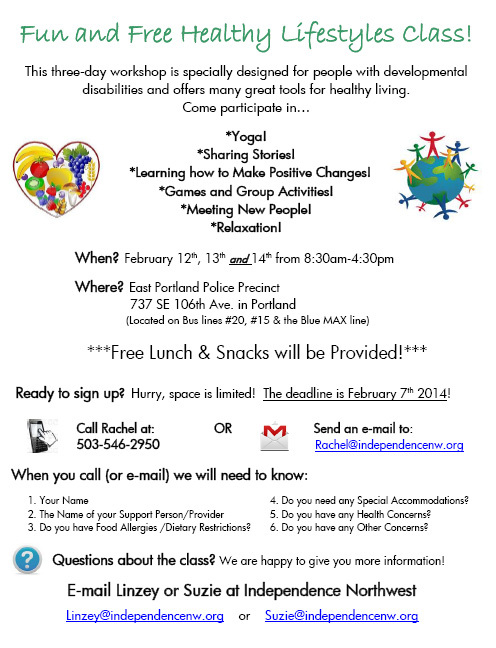 Healthy Lifestyles for People with Disabilities is a holistic wellness workshop designed for people with disabilities. The workshop embodies the self-determination model, and its ultimate goal is to give participants the tools they need to evaluate their lives and identify the areas in which they would like to improve to make positive changes. The workshop is divided into five modules including: Emotional Health, Social Health, Physical Health, Spiritual Health & Health through Meaningful Activities. Be prepared to share stories, participate in fun exercise activities, identify your dreams and learn useful tools that will help you live a happy, healthy and fun life! Free lunch and snacks provided! 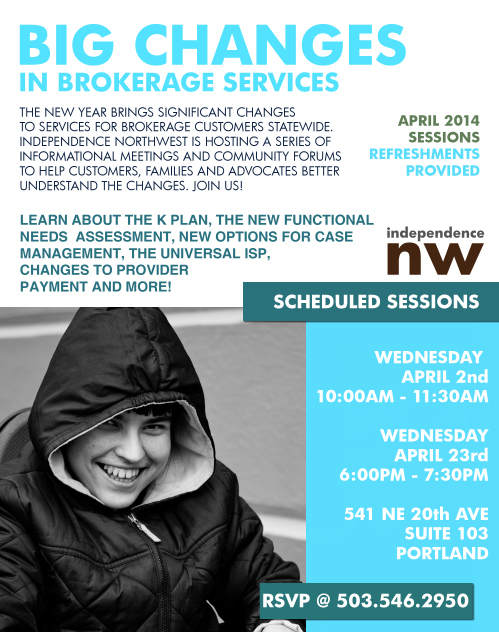 RSVP your space by calling Rachel at 503.546.2950 or emailing rachel@independencenw.org. We look forward to seeing you there!